This week's featured performer is Chris Chandler, a true man of the road who has worked with a who's who of the American political-folk scene, including Allen Ginsberg, Ani DiFranco, Pete Seeger and Mojo Nixon. His 1998 CD, "Collaborations," is true to its title -- a highly charged baker's dozen tracks recorded with friends such as Catie Curtis, the Austin Lounge Lizards, Dan Bern, Martin Sexton and Peter Yarrow. He'll perform at Stella's with pianist David Roe. Don't expect a typical folkie. Chandler has been called "a performance poet" whose wordy creations owe as much to the traditions of theater and slam poetry as to music. If he had been born in another time, Chandler would have been a roaming minstrel or an edgy court jester. As his press materials assert, "Today, gritty road warriors do the same -- outside the castle walls of corporate America," and Chandler calls himself "a troubadour road warrior." Born in Georgia and the son of a Baptist minister, Chandler worked as a roadie for bands as a teenager. After graduating from the North Carolina School of the Performing Arts in 1988, he set out as a street performer, living in his car and crossing the country, eventually joining a commune of traveling street musicians that led him into a world of college campuses, music festivals and activism. Last year, Chandler returned to the Washington area after more than 250 dates on the road, so this show may have a bit of a homecoming vibe as well. 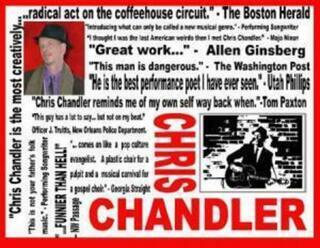 You can learn more about Chandler's life and music at his Web site, www.chrischandler.org.